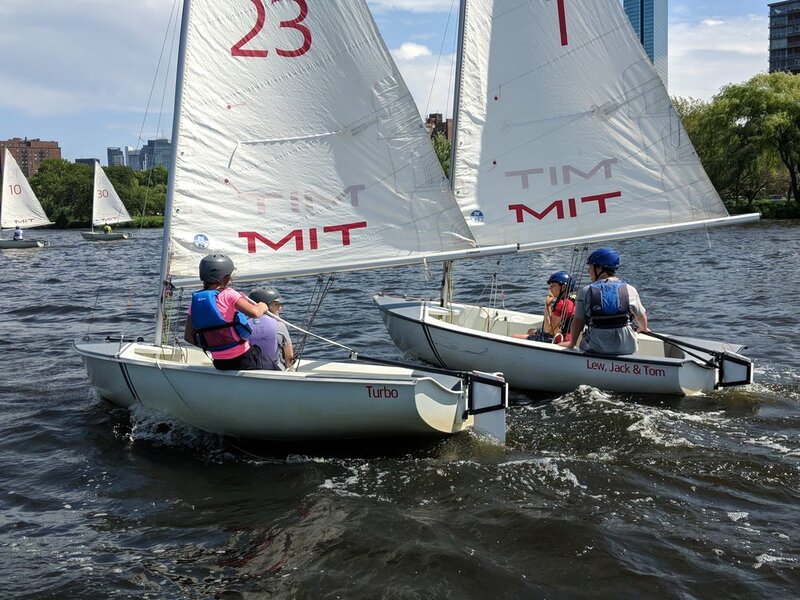 The Charles River Sailing Academy at the MIT Sailing Pavilion is open to sailors aged 11-16, and is led by MIT Sailing Coach and former U.S. Sailing Team Coach Mike Kalin and his staff of qualified and experienced instructors. Location: a five minute walk from the Kendall T-stop. Safety is paramount in all that we do at the camp. One of the biggest barriers to enjoyment on the water is getting over the fear factor inherent in sailing. The Charles River is a very safe venue — there is no current, the air and water are warm and the wind is typically light to medium (with the occasional windy day). There will be an occasional thunderstorm, but we monitor the radar every day and we’re never taken by surprise and are always safely ashore during the storms. All campers are required to wear closed toed shoes, Coast Guard approved lifejackets (provided), and helmets (provided). Additionally, we'll conduct a brief swimming competency test at the MIT pool on Monday morning. The swimming test consists of 50yds swimming (no time limit; not a race) followed by 2 minutes of treading water (no buoyancy aids). The beginner lessons are designed to introduce young sailors to the joys of sailing by empowering them with taking the helm of their own dinghy (while sailing in pairs of two) on the first morning of the camp! We have the ability to reduce sail are and provide a very safe and stable platform, so that the very first experience brings a smile to their face and rapidly builds confidence and an instant love of the sport. On water sessions are preceded by a lesson, and are kept to a manageable 50 minutes (four times per day). We alternate skipper and crew positions so that everybody is able to perform the tasks required for steering the boat, trimming the sail and working together with their body positioning to balance the boat and anticipate the adjustments required to keep the boat moving through the ever changing winds of the Charles River. The intermediate group will work on advanced boathandling and theory to be proficient with full-sized Tech sails in all wind conditions, as well as learning how to race. Sail theory will cover the topics of: what makes a sailboat go; weather helm; rudderless sailing; backwards sailing and hull dynamics. There will be considerable work on skill-building drills designed to master some intermediate level skills (lots of mark roundings, starts and short course racing). The class will be great preparation for a high school sailing team. The class will use a mix of double-handed Tech dinghies, single-handed Tech dinghies, Fireflies and 420s. MIT Tech Dinghy. The Tech is an ingenious small boat design that the world doesn’t know about. It’s proprietary design has evolved since its launch at the newly constructed MIT Sailing Pavilion in 1936. The current design is surprisingly lightweight and very responsive. The simple, stable, sturdy, single-sailed boat is sailed by beginner sailors through advanced racers. The boats can be sailed by one or two sailors at a time, and even allows space for an instructor to hop in to help guide beginners through the very early stages. The real brilliance of the design is the sense of security offered to the sailor: high topsides provide a feeling of safety and the raised booms mean that an accidental gybe won’t result in a head hit (although students wear helmets regardless). There is a foam flotation device integral to the top of each sail, so that in the event of a capsize, the boat will not “turtle” or take on water. A boat can be self-rescued in seconds and beginners quickly learn that a capsize is just a matter of going for a quick swim, then getting the boat right back upright and getting sailing again almost immediately. 420 Class Dinghy is a double-handed (2 crew) monohull planing dinghy with centreboard, bermuda rig and center sheeting. The name describes the overall length of the boat in centimeters (the boat is exactly 4.2 meters long). The hull is fiberglass with internal buoyancy tanks. Fireflies. A 14 ft, UK designed double-handed boat with main and jib sail. They are used by the MIT racing team, and are available to advanced sailors in the camp. 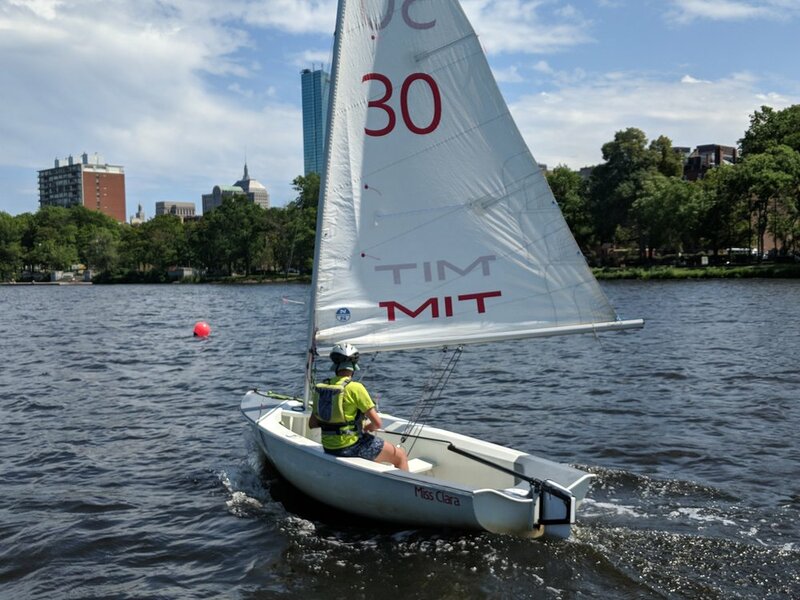 The MIT Sailing Pavilion is home to the MIT sailing team and offers a perfect platform for dinghy sailing, whether you are a beginner sailor, or advanced racer. Mike Kalin is MIT Sailing head coach, and the head coach and director of Building 51 Sailing. Mike has been with the MIT sailing program since 2014, and previously from 2000 - 2006, helping the coed team to a consistent ranking among the top 15 in the nation, with the squad placing as high as 11th at Nationals. Charles River Sailing Academy LLC is a summer sailing camp for kids aged 11-16, that is run out of the MIT Sailing Pavilion in Cambridge, MA. The program uses Tech Dinghies and 420s. Program dates: June 18-August 24, 2018. The standard work day is 8:30am-4:30pm; camp runs 9am-4pm. Working at Charles River Sailing Academy. Our goal is to create lifelong sailors out of each of our summer campers. We are seeking highly motivated and enthusiastic individuals with a strong background in leadership, teaching, and sailing skills. Instructors are responsible for leading campers in engaging activities that help develop self-confidence, self-esteem and provide an overall fantastic summer camp experience. Staff will be responsible for ensuring the health and safety of all camp participants, and facilitate groups and individuals in a manner that is consistent with the mission and philosophy of CRSA. CRSA believes that summer sailing should be fun and challenging and we want to empower our campers with confidence and freedom that the sport of sailing can provide. Full-time positions (40 hrs/wk) are available from June 18 – August 24. We would consider partial summer employment for qualified candidates. Learning to sail can be intimidating and scary for many kids. The ideal candidate is empathetic to this fact, but will also promote a positive and safe environment where campers will quickly gain confidence and develop a love for being on the water. Our goal is to get our campers sailing quickly -- most campers will be proficient sailors (sailing close hauled, tacking/gybing) in 10 knots of wind by the third day of camp. The ideal candidate should have experience sailing at the collegiate level. The goal of the program is to develop intermediate sailing skills in 420s and introduce some basic racing skills. Are you a high school student interested in becoming a camp counselor or working with children? Do you want to do something fun and rewarding over the summer and be on the water? The role of a CIT is to be a positive role model and leader to campers enrolled in CRSA. Tasks may include organizing, assisting and setting up/breaking down program equipment, supporting staff and campers during daily transitions and assisting instructors with activities by providing help to individual youth. CITs are expected to attend regular check ins, arrive promptly at the start of their shift and after returning from their break, complete a weekly timesheet, and will be supported, coached, and evaluated by the camp director. 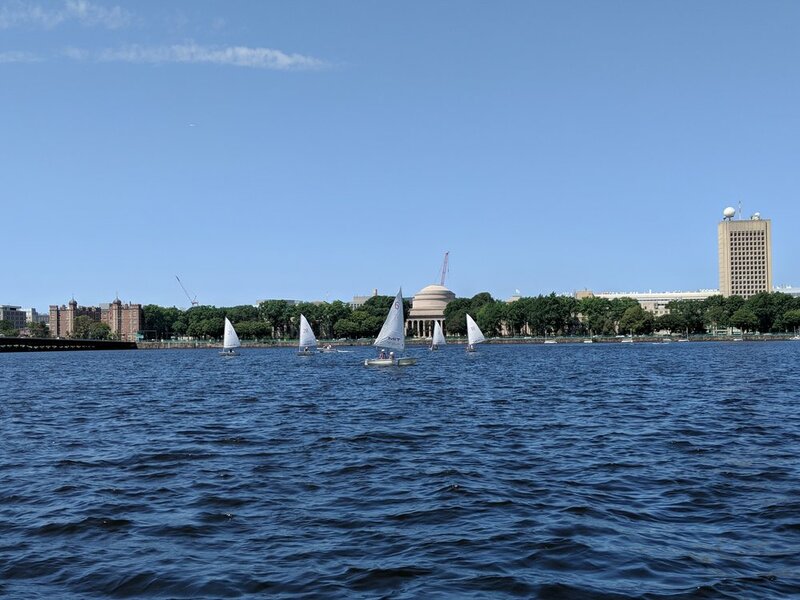 Access to the MIT community race series that takes place most evenings in the summer (Tech racing on Tuesday, Team racing on Thursdays) – membership covered by CRSA. There may be additional opportunity to gain extra hours working as dockstaff at the MIT Sailing Pavilion (a position unrelated to CRSA, but at the same facility). Suitable candidates would be interviewed by the Dockmaster at MIT. Candidates should be ambitious, self-starters that are comfortable leading teams and developing youth.